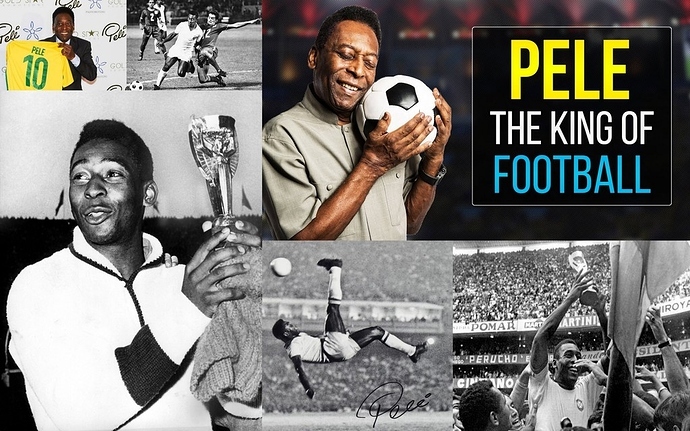 ⚽ Pele - The King Of Football! Edson Arantes do Nascimento (born 23 October 1940) also called Pele is a legendary sporting figure and an iconic soccer player who during his active years ruled the game to the point of being called the ‘King of Football’. Till date, he is widely regarded by football fans, critics, experts and players as the greatest player of all time. Nicknamed ‘The King’, Pele, with his impeccable style, electrifying play and impressive performance scored a total of 1281 goals in 1363 games. Pele is the most successful domestic league goal-scorer in football history scoring 650 goals in 694 League matches. He became the youngest ever soccer player to score a World Cup goal, when he scored a goal against Wales in 1958 World Cup and also holds the record of becoming the youngest player to score a hat-trick in World Cup. He is also the youngest football player to play in a World Cup final match. He was the star in Brazil’s World Cup win in 1958, 1962 & 1970. Pele received numerous prestigious honors, The International Federation of Football History & Statistics (IFFHS) voted him as the ‘Football Player of the Century’ in 1999. Additionally, he was elected as the ‘Athlete of the Century’ by the International Olympic Committee. Gifted and most iconic footballer! This ball trick was just amazing. Amazing Skills! Latino Footie on display in it’s full glory!